Product information "Lithiumbattery TRAVELSCOOT 274 Wh"
Lightweight 1,85 Kg battery sized 30 x 10 x 5 cm high quality lithium battery for ranges up to 20 km / 13 mls up to 3 pcs on one scooter adjustable! Incl. LED battery indicator. Only chargeable with the special lithiumbatterycharger. You need to have a suitable TRAVELSCOOT lithiumcharger! 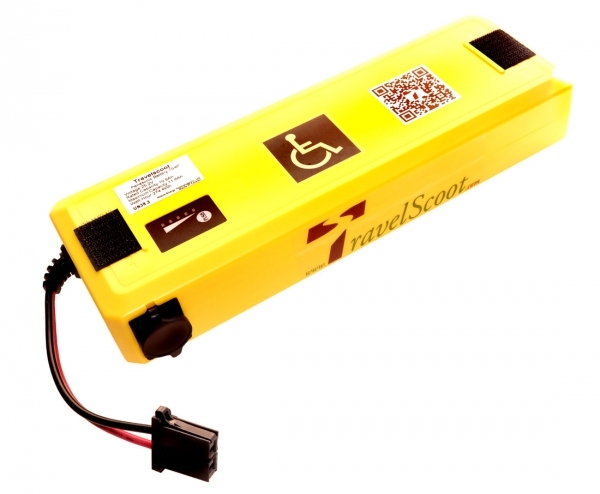 (Following IATA regulations per mobilityscooter 2 of this batteries allowed for air traveling due to the energysize of < 300 Wh). Related links to "Lithiumbattery TRAVELSCOOT 274 Wh"